Corporation Nation (Haney Foundation Series) by Robert E. Wright delves into the history of the corporation, particularly in pre-Civil War United States (the antebellum period). Like the earlier reviewed Shareholder Democracies? : Corporate Governance in Britain and Ireland before 1850, Corporation Nation addresses central issues such as agency theory, democracy and public interest through the lens of history. 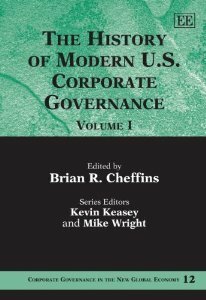 This unique “must have” two volume set traces the development of corporate governance thought around the core issue of the separation of ownership and control while also touching on the board of directors, executive pay, shareholder activism and the regulatory structures that shape corporate governance in the U.S. I include the index to both volumes at the bottom of this review for your reference. The word “modern” in the title refers roughly to the post 1970 world. While staggered boards are known to be negatively correlated with firm valuation, such association might be due to staggered boards’ either bringing about or merely being the product of the tendency of low-value firms to have staggered boards. In this paper, we use a natural experiment setting to identify how market participants view the effect of staggered boards on firm value. In a recent and not-fully-anticipated recent ruling, the Delaware Chancery Court approved the legality of a shareholder-adopted bylaw that shortened the tenure of directors whose replacement was precluded by a staggered board by moving the company’s annual meeting up from August to January. We find that the decision was accompanied by abnormal and economically meaningful positive stock returns to firms with a staggered board, relative to firms without a staggered board. The identified positive stock returns were especially pronounced for firms likely to be impacted by the decisions, because (i) their past annual election took place in later months of the calendar year, (ii) they are incorporated in Delaware or (iii) do not have supermajority voting requirements that make it difficult for shareholders to amend the bylaws. The identified positive stock returns were also especially pronounced for firms for which control contests are especially relevant because of their (i) below-industry return on assets, (ii) relatively small firm size, and (iii) absence of supermajority voting requirements making a merger of the company difficult. Our findings are consistent with market participants’ viewing staggered boards as bringing about a reduction in firm value. They are thus consistent with the policies of leading institutional investors in favor of proposals to repeal classified boards, and with the view that continuation of the ongoing process of board declassification by many public firms will enhance shareholder value.